i was wondering on how they were fastened myself. after your explanation & looking at the picture again i can see that the screw is used as a pin behind the bracket like a "T".it looks like you pushed the blinker in all the way through the bracket hole, made a flush mark on the material sticking through the back side, offset the radius of the hole size from you mark & drilled. do the blinkers slide out at all leaving a gap? they look real good by the way, nice job. i have a few day off comming up and this is one of my projects i would like to do. Last edited by dutter; 08-27-2008 at 02:52 PM. do the blinkers slide out at all leaving a gap? 2. Depending on the head size of the screw/bolt/cotter pin/what ever you use. That's what you'll determine your distance for your hole. To far out, yes sloppy. To close, won't fit. It doesn't take much to hold them in as they don't weigh much of anything. Thanks for the update. Going to give it a try this weekend. Hey Kanuck that shave does look pretty good. There is one thing I wonder about it. I drive for a living, and every day I mutter at others on the road who don`t signal before a turn. Then as they turn and the angle changes I can see the signal flashing. I think the reason so many signal lights are so hard to see is because they are located too close to the headlights and brake lights. With the brighter bulbs used today in both headlights and brake lights, I some times just can not see those signals tucked in so close. I don`t know if others perceive this as a problem or if I am alone in this. With all the emphasis we put on safety and being noticed by those driving around us, I wonder if this shave is really an improvement. JMO. 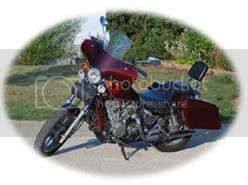 1991 VN 750 -"Cosmic Lady" or "Bad Girl"? TOP TEN THINGS A NEW RIDER/OWNER SHOULD DO. Click on link. Well you can't please all the people all the time but you can please some of the people some of the time. Atleast I didn't use a small tear drop tail light! I get wgat your saying about the light issue. It would be a better world if people would drive better... wouldn't it. I wouldn't think the small amount that this mod moves them in would be a safety problem. Maybe convert to brighter LED bulbs? The rubber stalk helps with "give" however and the shaved signals may be more prone to breaking off or bending if hit. They do look nicer shaved, IMHO. i did my fronts they look great (very chopper like look). in my opinion bringing them in closer may make them a little less visible from some angles. Looks great, but not a good idea in AZ. The law says the signals have to be a certain distance apart. Sport bike riders are constantly getting busted for aftermarket signals that are not street legal. I put clear lenses on mine, with amber bulbs. Was thinking about replacing my signals and came across this thread. Think im gonna give this a shot today before ordering anything. Really like the look of this, nice work Kanuck!